Arrive to park 15 minutes before you wish to arrive at your terminal. NOTE: FastTrack Airport Parking drops all passengers at the DOMESTIC terminal. A FREE airport shuttle takes passengers to the INTERNATIONAL terminal. Please allow plenty of time if you are flying out of the international terminal. 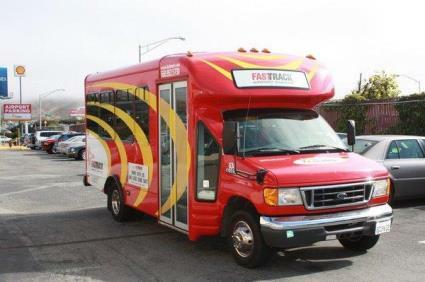 FastTrack drops you at the domestic terminal; another free airport shuttle takes you to the international terminal. FREE shuttle from your car to/from all airport terminals is provided 24 hours a day on demand. After collecting your luggage upon return at ATL, call 404-559-4475 for pick-up. Go to the Ground Transportation Center near baggage claim, which can be accessed by exiting through the corridors of the North or South West End (W1 or W2) of the airport. FASTTRACK Airport Parking is Row E, Space 2. FASTTRACK Airport Parking is open 24 hours a day and offers free transportation to and from the airport terminals on demand. A shuttle service is also available to the Cruise Pier and Amtrak Station. Car care services are offered for an extra charge; please inquire at check-in.